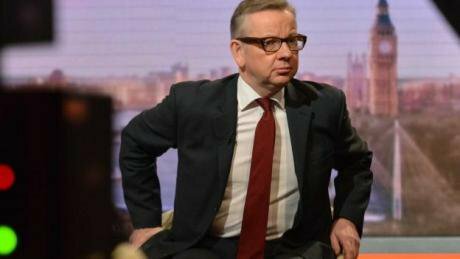 When last year education minister Michael Gove, having dropped in on a food bank, declared that stricken families had their own poor decision-making to blame, that piqued my curiosity about Michael Gove. Had Gove made the right decisions? Had he managed his finances well? He’d decided to accept handouts over and over again. From the taxpayer. From Rupert Murdoch. From fund managers and insurance people. He’d even got his opera tickets for free. And shirts! From Jermyn Street’s New & Lingwood (purveyors of “Relaxed Sophistication”). • Anthony Salz: Star corporate lawyer (formerly of Freshfields), he’s on the board at Rothschild, the bankers. 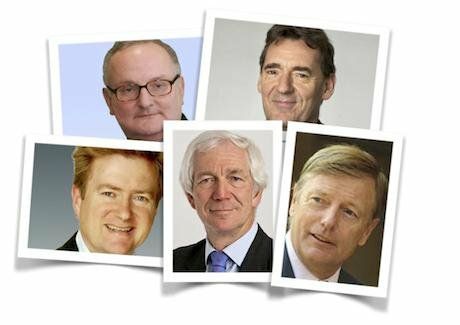 • Jim O'Neill — he used to be chairman at Goldman Sachs Asset Management. Hang on a minute . . .
What are ‘non-executives’ doing on government department ‘boards’? Well, that’s something the Coalition government started. To find the right chaps they employ headhunters and consult the list of Big Tory Donors. It’s all part of (don’t laugh) a “drive to improve governance across Whitehall”. Until Gove’s abrupt removal to the whips’ office yesterday, the favoured candidate to be chair of Ofsted, the schools inspectorate, was a man called David Ross. He’s not a teacher or a schools inspector. He’s the Tory party donor who founded Carphone Warehouse. His David Ross Educational Trust controls a chain of 25 academy schools and has got former schools minister Nick Gibb as a trustee. That’s Nick Gibb, the MP for Bognor Regis, and former corporate tax adviser at KPMG. After the reshuffle, Gibb is back in his schools minister job. He’s a trustee of the free-market think-tank Civitas; they run Saturday schools for children — “one of the most inspiring projects in the country today” according to the Spectator’s Fraser Nelson). Carphone Warehouse, by the way, (according to Annie Powell here) devised a nifty ‘Tablets for Schools’ scheme, endorsed by Gove, whose department recommends that schools spend 3 per cent of their budget on ICT procurement. No fewer than four of Gove’s departmental staff have enjoyed two-year secondments to organisations that sponsor academy schools. (glossary note: sponsor (verb) = control; come full scale privatisation that will be own). That’s two civil servants at United Learning Trust. (They’re the guys who claimed not to know how much their senior executives were paid). And one civil servant at REach2 (controlling 30 primary schools in England). And one at . . . The David Ross Educational Trust. Does the public know what’s going on? ‘Academy status’ is being presented to parents, teachers and governors across England as benign, a way of taking back control of money being wasted by lazy local authorities. Then, before you can shout “Land Grab!”, schools’ buildings, land and other assets are handed over to philanthropic-sounding ‘trusts’ with links to private equity and hedge funds. 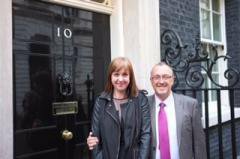 REAch2′s chief executive & deputy, Steve Lancashire & Cathie Paine met the PM, May 2014That education civil servants are being seconded to serve Tory donors and academy chains popped into the public domain only because Labour MP Andrew Smith asked a Parliamentary question about it. He was lucky to get an answer. When Labour MP John Healey asked Gove to list the salaries of the heads of each academy trust (they are ginormous), the minister replied that collating the figures could be done only at “disproportionate cost”. Whom does Gove serve? Our children? The taxpayer? Or his other present and future paymasters? Back in 2004, soon after Gove, a Times newspaper executive, was selected for the safe Tory seat of Surrey Heath, Rupert Murdoch’s publishing house Harper Collins handed him an advance to write a book about an obscure eighteenth century politician called Henry St John, Viscount Bolingbroke. Ten years on, Gove hasn’t delivered. The Guardian asked the publisher whether Gove’s advance should be returned. Harper Collins replied that Gove “is still committed to writing a book on Bolingbroke but obviously his ministerial duties come first for now”. For the past three years he has accepted £3,000 every year from a Surrey lettings agent. Last year the fund manager Linda Jane Coffin tipped him £2,800, management consultants Copeland Blue another £3,000, property developer and Tory councillor Kim Gottlieb gave him £5,000. In February, Gove registered a £5,000 wad from advertising mogul Jerry Buhlmann. In March £5,000 from Henry Lumley . . . and so it goes on. You don’t have to take my word for it. It’s all in the latest edition of the Register of Members’ Interests. Gove helped himself generously to Parliamentary expenses, as The Daily Telegraph revealed: £7,000 in a five month spending spree on his West Kensington house. 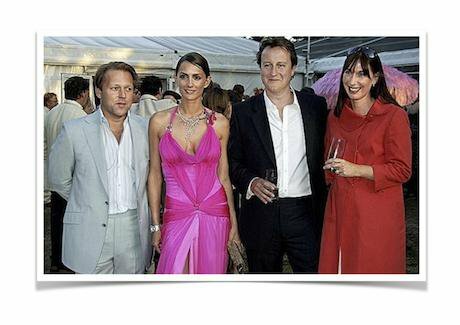 Much of it spent at Oka, an upmarket interior design company established by Lady Annabel Astor, David Cameron’s mother-in-law. Author’s note: Two of the best sources on education ‘reform’ are Local Schools Network and David Wolfe QC’s blog: A can of worms.